Welcome to Unity Peace Park! Our vision for Unity Peace Park is to become a sustainable, community green space, inspiring peace in our hearts, our city, and in our world. If you would like to find out what you can do to help make this vision a reality, please contact info@unitybuffalo.org, or simply make a donation. The entrance is a good place to stop, reflect and set an intention for your spiritual walk. Perhaps you’ll have a question that you are seeking guidance about. As you walk, focus on the intention. At the center, you can take as long as you wish, being open and receptive to spiritual guidance. Take time to turn and look in all directions. On the return journey, focus on what you bring from the center. The important thing to know is that there is no right or wrong way to walk a labyrinth. If you want, you can run or skip or play a flute. You can use a labyrinth in whatever way works for you. 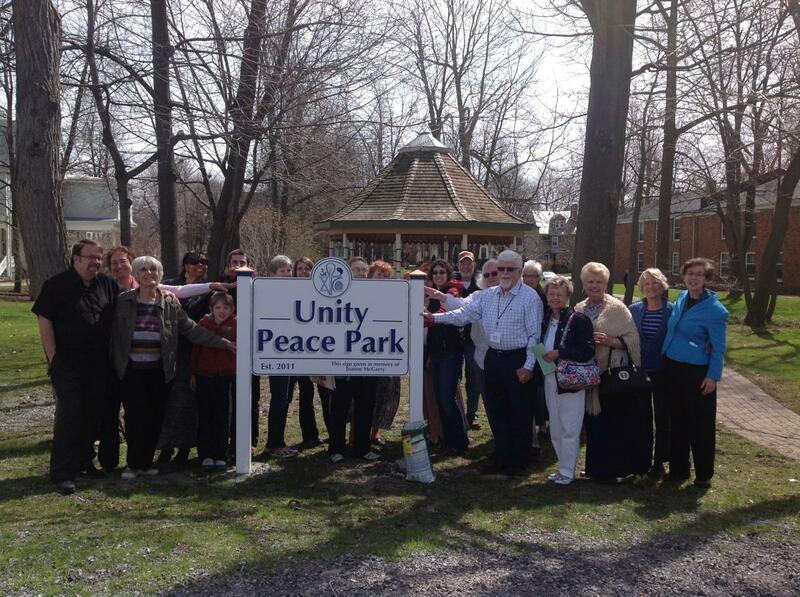 To make a reservation for the use of our Unity Peace Park by a group or organization, or to schedule a wedding, please contact our Church office (info@unitybuffalo.org or 716-882-0391). Reasonable rental fees and terms are available. Sponsoring a brick in our labyrinth is a special way to remember someone who has passed, acknowledge someone important in your life, or just put a message on brick that will bless all those who walk the path. Bricks are $100 each and may be ordered through our church office. Many people have contributed to making our Unity Peace Park possible, most especially the members of our congregation that have held this vision and contributed time, talent and treasure. We are also very grateful for grant monies that have been received through our State Senator’s office, the City Common Council member’s office, and the Riefler Foundation, administered by the Network of Religious Communities. Also a special thanks to the Buffalo Zoo for their donation of over 7,000 bricks to pave our walkway. Over the years our Unity congregation has consistently held a commitment to staying in the city of Buffalo and working with our friends and neighbors to improve life in the city for everyone. One way this commitment is expressed is through the fulfillment of our vision to take what was at one time, a couple of empty and neglected city lots and turn them into a vibrant green space with park-like amenities and a handicapped-accessible labyrinth at the center. Our intention has been to create a beautiful and useful space for collaborative projects, community events, and family recreation and for individuals seeking a meditative experience in a lovely environment. To this end, the Unity Peace Park was dedicated to Peace in our hearts and in the world on June 2nd, 2012, the day of our grand opening ceremony for the Unity labyrinth. 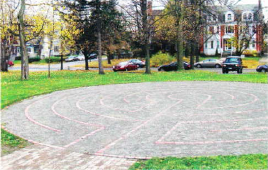 Since that time, we have also celebrated World Labyrinth Day and hosted many events including our annual summer church picnics, weddings, parties, community gatherings and much more! The mission of our Unity Peace Park is to be a sustainable, community green space, inspiring peace in our hearts, our city, and in our world.